Do you have a puppy? Thinking about getting a puppy? Want to do a better job next time around? I like to think each puppy I start grows up to be better than the ones that came before. I am always learning. This collection started out as a brief tip sheet for several students I had that were getting puppies about the same time. This is what it evolved into. It will also be updated as time goes on as I think of other things or find better ways of doing things. 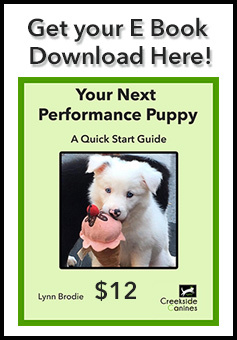 Even if you've never had a performance puppy before, I'm sure you'll find useful information in this book. So here are about 22 pages of brief tips designed to make life with your next dog much easier. This is not a step by step how to. In a number of cases, I've given you links to resources for learning some of the concepts in a detailed fashion if you're not already familiar with them. If you train with me, you have the added advantage of being able to address these things directly with me.